Bus from Singapore to Teluk Intan is an important bus service because there is no other alternative transportation option in Singapore to go Teluk Intan. 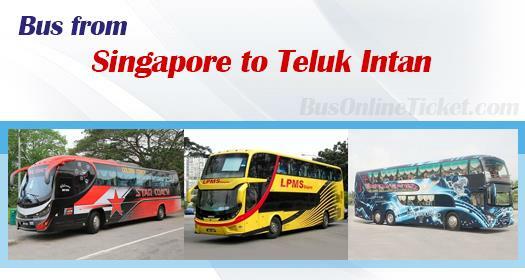 Golden Coach, Grassland, Konsortium, LPMS, and The One Travel are the few bus operators provides daily bus from Singapore to Teluk Intan. Please note that all bus services from Singapore to Teluk Intan are only available in the morning session around 9-10am and night session between 9pm-12 midnight. There is no schedule in the afternoon. Golden Coach is the only bus operator providing bus from Singapore to Teluk Intan at midnight 12. Golden Coach midnight bus service is especially convenient for passengers who are working in service industry. In the past, passengers who want to go back to Sabak Bernam, Simpang Empat and Sungai Besar would need to take bus from Singapore to Teluk Intan first, then transfer to another transport going to Sabak Bernam, Simpang Empat and Sungai Besar. After launching of LPMS bus service, they are no longer needing to suffer the transit by taking LPMS direct bus from Singapore to Sabak Bernam, Simpang Empat and Sungai Besar. LPMS coach takes different route to go from Singapore to Sungai Besar, Sabak Bernam and Simpang Empat first before terminating at Teluk Intan. The bus fare for bus from Singapore to Teluk Intan is ranging from SGD 41.50 to SGD 60.00, depending on the coach operator. With the limited service daily, the bus fare may go up more than double of the original price during the high-demand festive season like Chinese New Year. The journey duration for bus from Singapore to Teluk Intan takes about 7-8 hours depending on traffic condition. All coaches leave from Singapore Tuas checkpoint and provide a meal stop and wash room break at either Yong Peng food court or the resting area along North South Highway. Because of the long duration journey, all coaches are equipped with spacious 3-seat-in-a-row type of seating to ensure comfortable journey for passengers. User-friendly online booking and secure payment environment make booking a bus ticket online with BusOnlineTicket.com is convenient and secured. Apart from that, with the choices of bus operators and options of departure times, these makes BusOnlineTicket.com becomes the most popular online booking portal among its customers throughout these years.